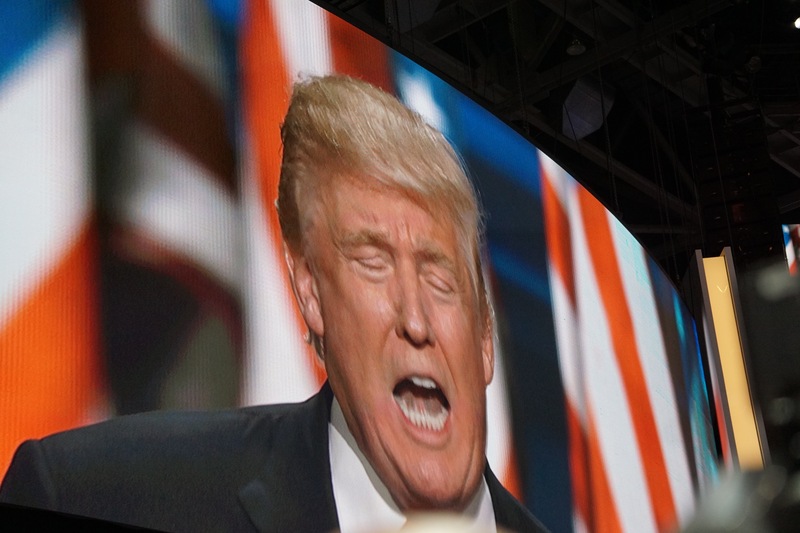 Donald J. Trump, looming large on a video screen at the Republican National Convention — and in 2018.. The volatility of Connecticut politics can be reduced to one question: Is it a bigger surprise that this blue state’s gubernatorial race is rated a toss-up by respected national prognosticators, or that Democrats still have hopes of winning the governor’s office and keeping control of the General Assembly? Democrats dominate congressional and presidential contests in Connecticut, but they haven’t had an easy race for governor in more than 30 years, and the GOP has gained seats in the General Assembly in three of the past four elections and held their ground in a fourth. 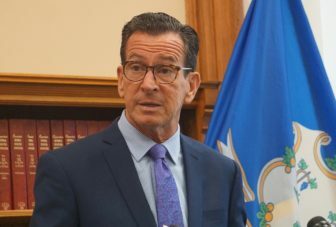 “Of course, Connecticut is in play in the governor’s race,” said Mark Bergman, a Democratic consultant whose clients have included Gov. Dannel P. Malloy, the Democrat leaving office with one of the lowest approval ratings of any U.S. governor. “But that being said, I feel a lot better about our chance in Connecticut than I did on Nov. 6, 2016. That was before Donald J. Trump was elected president. One of the great ironies in politics is that the election of a Republican president has injected uncertainty into what had seemed to be an inexorable, 10-year march by the GOP from irrelevance to dominance at the State Capitol. Anger at Trump now competes with dissatisfaction over Democrats’ stewardship of the state’s finances and economy. Democrats and Republicans are struggling to handicap what will be the biggest factor in 2018: the performance of an unpopular Democratic governor about to exit the field or an unpopular and unpredictable Republican president with more than two years left in his first term? The latter question is the one that haunts Republicans, who concede the president is never more than one Tweet away from dominating a news cycle, for better or worse. Boucher, who is exploring a run for governor, is among the Republicans who acknowledge that the election of Trump has been a gift to Democrats, while she still thinks the state budget and economy give the GOP an edge. The Resist Movement has inspired progressives to organize, soothing some of the hard feelings and divisions left by the Democratic establishment’s favoritism of Clinton over Bernie Sanders in 2016. Some of those activists, particularly women, already have opened campaigns in a half-dozen legislative districts. But Romano questions if that energy can be sustained and whether it reaches beyond hard-left partisans already active. Boucher spent Saturday outside a Stop & Shop in her hometown of Wilton, a Republican suburb in Fairfield County, a GOP stronghold where the president’s support is weak. The state’s fiscal woes dominated her conversations with voters, followed by dissatisfaction with Trump and horror over the school shooting in Parkland, Fla. Questions about Trump reminded her of 2008, when she ran for the state Senate for the first time, and John McCain’s selection of an obscure Alaskan governor, Sarah Palin, generated unexpected questions, such as her thoughts about hunting bears from helicopters. Barack Obama crushed McCain in Connecticut. Connecticut Republicans hit bottom with the election of Barack Obama as president in 2008, losing their only seat in Congress and winning just 37 of 151 seats in the state House of Representatives, the worst showing by any party since voters abandoned the GOP in the post-Watergate landslide of 1974. But no politician since 2008 has had coattails, and Republicans have shown they can compete for legislative offices, despite a gaping disadvantage in voter registrations: Democrats outnumber Republicans, 771,412 to 453,625. Unaffiliated voters number 861,766. Malloy was elected governor in 2010, the first Democrat to win that office since William A. O’Neill in 1986. But Republicans picked up a stunning 15 seats in the state House that year, jumping from 37 to 52. The GOP lost no ground in 2012, despite Obama’s cruising to re-election. And Republicans gained seats in 2014, when Malloy was re-elected, and again in 2016, when Hillary Clinton carried Connecticut and U.S. Sen. Richard Blumenthal, a Democrat, was re-elected. Republicans won 72 seats in Connecticut’s House two years ago, just four short of a majority. They managed an 18-18 tie in the Senate, where Democrats had won two-thirds of the seats in 2008. Democrats kept nominal control only by the tie-breaking ability of Lt. Gov. Nancy Wyman, a Democrat. But after losing so much ground, many Democrats looked at 2018 with dread. Two political setbacks have given Democrats hope: One is the president’s election; the other is the Democrats inability to pass a budget in 2017, which led to a bipartisan compromise. Liz Kurantowicz, a Republican operative who oversaw a nationally funded independent-expenditure campaign that targeted key legislative races in 2016, said Republicans have yet to match the energy exhibited by Democrats in the 2017 municipal elections. One of the variables, of course, will be who are those candidates. There is no consensus leader for the gubernatorial nominations in either party. Ten declared Republican candidates have raised sufficient funds to earn invitations to a candidate forum to be held Wednesday night in West Haven. It is the third of five monthly forums sponsored by the state GOP. A half-dozen Democrats are expected to compete for the nomination at the convention in May. There are expected to be at least five state senators who are either retiring or seeking higher office: Democrats Ed Gomes of Bridgeport and Paul Doyle of Wethersfield, and Republicans Tony Guglielmo of Stafford, Art Linares of Westbrook and Joe Markley of Southington. Boucher could be a sixth. In the House, Democrats are concerned about the retirements of Danny Rovero of Killingly and Linda Gentile of Derby, as well as the likelihood that William Tong of Stamford will run for attorney general instead of re-election. Republicans are expected to be competitive in all three districts. Anti-Trump messages are unlikely to play well either in Rovero’s district in eastern Connecticut or in the Naugatuck Valley, where Gentile is the only Democrat still holding a state House seat. Trump beat Clinton in the valley, as Sanders did in the Democratic primary. Kara Rochelle, 35, a Democrat who hopes to hold Gentile’s seat, is a 35-year-old progressive who volunteered for Sanders in 2016.